Peru is a country of Andean communities, fascinating cultures and mesmerizing landscapes. It’s also home to one of the oldest civilizations in South America, and the magnificent ruins of those era are scattered all over the country. Because of this and other attractions like the Amazon, world’s highest navigational lake, and other spectacular sceneries, thousands of visitors flock to Peru every month. Despite the growth in tourism, Peru still remains a very poor country and the government programs often fail to reach grassroots level, especially the indigenous populations. New Hope Volunteer provides you ample opportunities to experience the beauty of Peru and make a significant contribution in the lives of needy, and through our conservation project save the nature. In our projects, our volunteers can help orphaned and helpless children in an orphanage, teach English and other subjects in resource poor schools, work in medical/health projects and contribute towards saving the environment. New Hope Volunteers will arrange for the accommodation and meal of the volunteer throughout the program. Volunteers will stay either in a hostel or with a host family. In the hostel, you’ll share room with other volunteers and swap stories and experiences. Our host families have been carefully screened and chosen and they will have experience of hosting international volunteers before. The host families will provide you with a warm, comfortable and secure place to stay. You’ll have a room for yourself and at least one member of the host family will be able to communicate with you in English. Living with a host family will also provide you with a wonderful opportunity to learn about local culture and customs and make local friends. Volunteers will be served 3 local meals a day in both the hostel or with a host family. During the volunteer program, our country coordinator will be in touch with you every 10-15 days to make sure you’re comfortable and happy. Volunteers will also have access to coordinator’s mobile phone and can call up anytime if any problem arises. When should I apply for the volunteer/internship programs in Peru? 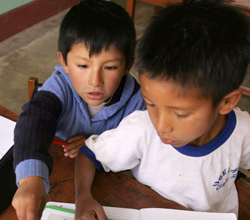 Are there any necessary requirements to participate in the Peru-based volunteer programs? Who manages the volunteer projects in Peru ? When are the Peru-based projects available? How safe is Peru ? What is weather like in Peru ? What about tipping in Peru ?